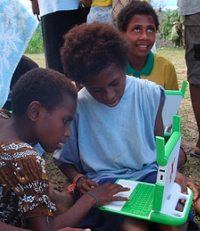 In Papua New Guinea (PNG), One Laptop Per Child trials were started in June at Gaire and Dreikikir. Only grade 3 was involved in each school owing to availability of XO laptops at that time. Also, insufficient training was given. However, both sites have been assessed by the Department with the assistance of the SPC advisor, and arrangements made to complete both schools so that all teachers and students will receive laptops, by the end of the year. The implementation will involve full training for teachers and introduction of support and monitoring arrangements. DWU and DBTI playing their roles as described above. A properly conducted monitoring and evaluation process is required. However, this has not yet been introduced by the Department and the Department is yet to develop an objectives framework and implement the measurement and evaluation (M & E) component. However, there are some observations that can be made following the five months since the trials were started in June 2008. The SPC advisor David Leeming visited both schools in November 2008 accompanied by representatives from the Department. Teachers were asked to give feedback. Enormous enthusiasm from teachers. They really see the value of the programme and the head teacher is requesting the additional XOs immediately. They have been amazed by the self learning capacity, with learning continuing out of class, and obvious skills and knowledge of the grade 3s. The kids gave a demo and they were bursting with confidence, quite unlike their shy former selves during training in June. They have been using the XOs in lessons on a regular basis. Both guided and unguided. Examples, regular use of Record in science to investigate natural objects, calculate, write, speak. The teachers say that they totally accept and endorse the "agent of change" characteristic of OLPC, in terms of teaching practices. It is extremely timely as the same intended changes (active learning etc) are part of the current reform process. The XOs fit with that perfectly. The teachers report that the grade 3s are noticeably improved in terms of engagement in learning and motivated in and out of class. All children are now more included with fewer children being left out. On the other hand, the other grades are demoralised by not having XOs. This is a real negative impact, and adds urgency to saturate the full school. The teachers used the laptops to take photos to add to their attainment certificates in colour (each child has one end of year). Hardware: only 1 laptop u/s (but they will try to reflash it). One has no audio. Others all look pretty well looked after. The main issue - power - is solved. They have a robust work around solution, and we can make a more elegant one later. They actually bought a 5KVA generator specifically to charge the laptops, and have been doing a once a week in-school charge with the students finding power in their homes on other days. This is not enough for 300 laptops but can do it in two daily charges. They have grid power in evenings and will get that connected to school buildings. The flat rate is only PGK 15 per month (until the power company works out what is happening with PGK 6 per day being used when 300 laptops charged each day!!!). We designed a sort of shelving arrangement that will allow 300 laptops to be manageably stocked in shelves for charging each day. The gang chargers can be used later, and they are now not dependent on them. One example, they have already discovered creating games with "Memorise"
They are very impressed with the creativity of some of the students, for instance the standard of drawings using Paint is quite out of the league of the adults! The G3 teachers use the laptops quite a lot in class, both guided and unguided. They can allow the students quite a lot of freedom to use activities to tackle various tasks. The deputy head teacher has a G3 child, and he has made a lot of positive observations. He could also speak as a parent. He gave his child a question on science, and the child researched the answer on the Internet! This is a grade 3, 8 year old. Teachers have been using/borrowing laptops to research material for their lessons, as well as downloading materials and sending emails. As with Dreikikir, the ones without laptops have been a bit demoralised. One teacher very eloquently explained that until the whole school was saturated, judgement on the laptops is unbalanced. Two laptops of the 53 had problems, one has half the screen distorted (horizontal lines) and one has the dead battery syndrome. We managed to get the battery charging again although it is only very slowly taking up charge. They could not think of any negative impacts. What else can OLPC do? Two members of the Department accompanied the SPC advisor to Gaire on Sunday 23rd November and witnessed the skills demonstrated by five Grade 3 students and their teachers, in preparation for the demonstration at the press conference scheduled for Parliament. The students displayed advanced skills and the teachers illustrated guided learning. The Gaire teachers reported a visit by School Inspectors, who witnessed Grade 3 lessons with students using the laptops. The teachers stated that the inspectors were very impressed. There was one report of misuse of a laptop at Gaire (by an adult). The authenticity and timing of this report is uncertain, as the RICS system has been running a content filter for some time now. The appropriate child protection strategy is included in the annex. There is some excellent indication of the potential with children with disabilities. When DWU conducted teacher training for 87 teachers from schools in the area at St. Benedicts in October, they invited people from Callan Services, an international NGO that has centres around PNG helping people including children overcome disabilities. Some teachers from Callan Services in Wewak attended the DWU training and immediately saw the potential. Dr Alfred Tivinarlik, Dean of St. Benedicts, captured on video the Callan Services teachers using the laptops to create visual resources for teaching sign language. 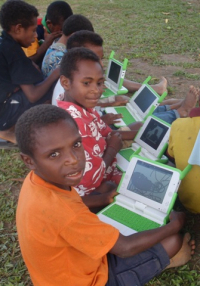 They also have a centre in Kiunga, where PNG Sustainable Development plan to start OLPC projects in their areas of interest. This feedback is in no way a substitute for a proper evaluation. SPC has plans for these, wishing to work with appropriate agencies and institutions. Part of the strategy for the trials is to work with Departments of Education to develop objective frameworks which can be measured. This is the case so far only with the Solomon Islands, where an evaluation framework was drawn up by the Ministry's technical working group as part of their sector wide programme.